Is summer really only two months away?! It’s time to start narrowing down those travel options for your family vacation. While it can be tempting to choose from a list you may already have in your mind of a place or two you have been meaning to go, let me tell you why letting the “deal” dictate your location can be financially advantageous. One type of option to consider is cruising. Just like tours, the closer you get to a cruise, the cheaper they become. This is because the boat doesn’t want to leave half-empty! Money is made when people are on-board, so they heavily discount when it gets close to the departure date. A travel agent can be useful for this purpose, however if you want to plan it alone Cruise Sheet or Cruise Deals are two of the most helpful websites I have found. The trick with this option is definitely flexibility! You may not have much room to choose the destination of the cruise or the exact cabin available. One tip to remember is that you can usually call the cruise line or travel agent and if the price drops before you cruise, you might be able to get the difference in the price drop as on-board credit. Just be diligent on checking the numbers and you can really come out ahead. Traveling with kids? Some airlines offer amazing deals when traveling with kids. The best I have seen that comes to mind is with Scandinavian Airlines. Usually one to two times per year they offer a kids fly free deal (up to 8 children!) where you only pay taxes/fees (usually $20-50 per child). Their deal originates from select airports in the U.S. and works for any destination in Scandinavia (Finland, Sweden, Norway etc.). A friend of mine was able to bring herself and her two children to Stockholm from Los Angeles for $550 total for the three of them. Frontier Airlines has been running their own kids fly free deal as well with differing limitations. However, if you live near a Frontier hub, this can be very beneficial. Want to instead enjoy our own backyard, maybe with a road trip? How would you like that road trip to be free or at an insanely low cost? Am I starting to send like a click-bait Facebook ad? I get it. But trust me when I say that an RV relocation deal could be just what you need for the summer vacation road trip of your dreams! RV and car relocation deals come up when a rental car company needs a rental to be moved to a different rental office, one way. This can be for supply and demand reasons or sometimes when a vehicle is getting ready to be sold. The reason it is so cheap (usually about $1 per day) is because it can be very expensive to hire a transport company or alternatively pay someone to drive it to the other location and then pay for their return flight. iMoova and Jucy are the most utilized search engines in the United States to find these deals. Keep in mind that the best deals are only a few weeks out as desperation creeps closer. Fun fact: sometimes you can even get gas reimbursement incentives or amenity kits, so it’s always worth asking. 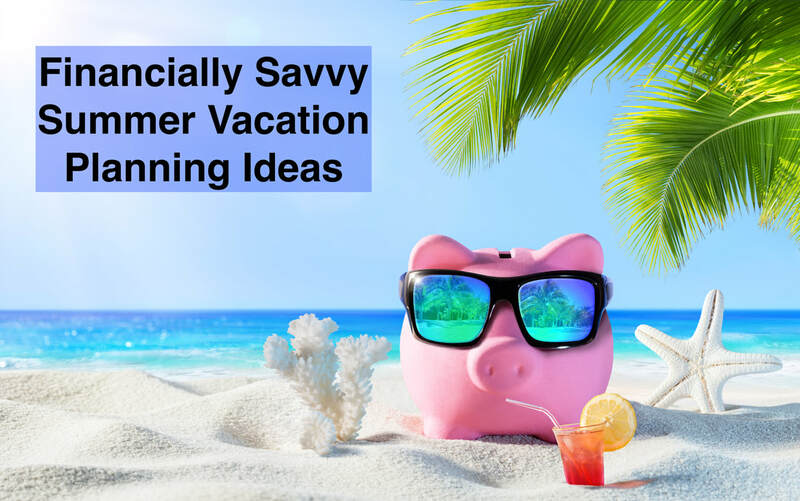 Traveling this summer does not have to break the bank. It’s important to not take on an exuberant amount of debt, or hopefully any debt for that matter to make vacation memories. Be creative and enjoy! 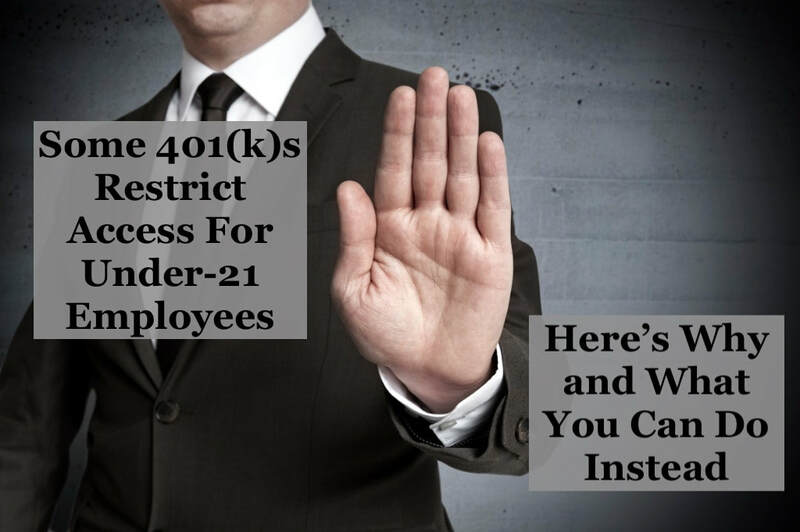 Some 401(k)s restrict contributions for under-21 employees. Here’s why and what you can do instead. It’s an unfortunate gotcha for the young person who’s learned about the power of starting to invest early for retirement, but in fact it’s true, companies may elect to restrict enrollment in their 401ks to employees over age 21. In general, 401ks are highly regulated at the federal level by ERISA (The Employee Retirement Income Security Act of 1974). For the most part, these regulations are very much a good thing, even when they may seem annoying. The rules around 401ks strive to protect employees from malfeasance on the part of the employer or plan administrator with strict penalties for violations. For instance, if you elect to defer a certain amount to your 401k and the plan fails to execute your deferral, your employer may be required to make a contribute to the plan on your behalf of the half amount you elected that failed to be deferred (https://www.irs.gov/retirement-plans/fixing-common-plan-mistakes-correcting-a-failure-to-effect-employee-deferral-elections). So pay attention, and if something seems like it’s been implemented incorrectly, take the time to do some investigation and follow-up. If you’re sure they did something wrong and HR denies it, escalate to your legal department. HR does not know tax law. So back to the situation for under-21 employees. In these cases, some young people raring to get started saving for retirement may be shocked to discover their 401k didn’t allow one to enroll if they’re under 21. Usually 401ks must strive to treat all employees the same, but this is an exception. And why is that? Because it can result in significant cost savings, which hopefully gets passed on in the form of lower fees to employees. When an employer opts to open a 401k, they contract with a 401k provider, which will then set fees based primarily on the number of people and amount invested in the plan. Then HR runs the plan for employees. If you’ve got an employer I’d consider “good”, hopefully that plan has provisions like auto-enrollment of new employees, setting them up in a good default fund like an Target Date Fund, a contribution match that doesn’t have a vesting requirement, and allows you to leave your 401k there if you choose to after separating from service without excessive fees. But each of those benefits comes with a cost. There’s overhead to having more enrollees, overhead to anto-enrolling every employee, cost to providing a match, especially without vesting, and cost to letting past employees stay in the plan. So if you’re an employer that hires a lot of part-time employees, or seasonal employees, or interns, those people jumping in and out of your 401k plan are going to increase costs for everyone, and disproportionately to the amount of use they get out of the plan. In fact, one pattern I see among people who did have access to these “good” 401ks when they were under 21 is they were auto-enrolled unknowingly. They were initially unhappy, but accepting once they realized where part of their paycheck was going. However when they leave the employer after 3-12 months, then are below the minimum balance to stay in the plan so the amount is disbursed, and then they don’t know what to do with it and put it in their checking account and are hit with taxes and an early withdrawal penalty come tax time. So while the young people out there chomping at the bit to get started on saving for retirement are near and dear to my heart, this isn’t the worst restriction ever, and it may save you money in the form of lower 401k fees for all those post-21 years to come. Fear not, though, you’re not out of retirement savings options! If you to happen to be in the comfortable position to be able to start saving for retirement while young (meaning you have enough saved to cover a couple months’ expenses and no debt over 5% or so) and you can’t access or don’t have an employer who offers a 401k, you can still fund an IRA. Unless you are working full time and/or an extremely well-compensated young person, you probably want to be looking at a Roth IRA. Of course the issue you’ll run into with an IRA is you can only contribution $6000/year. And no, you can’t go back and contribute for prior unused years unless it’s before tax day when you have to file for that year. So if you have even more than that $6000/year you want to invest for the long-term, you can consider making a taxable investing account for the time being and planning to use money from there to subsidize your spending while you sink the IRS limit (currently $19k/year) into your 401k as soon as you turn 21. The 2018 tax season is fast approaching and this will be the first tax year the Tax Cuts and Jobs Act (TCJA) is in effect. 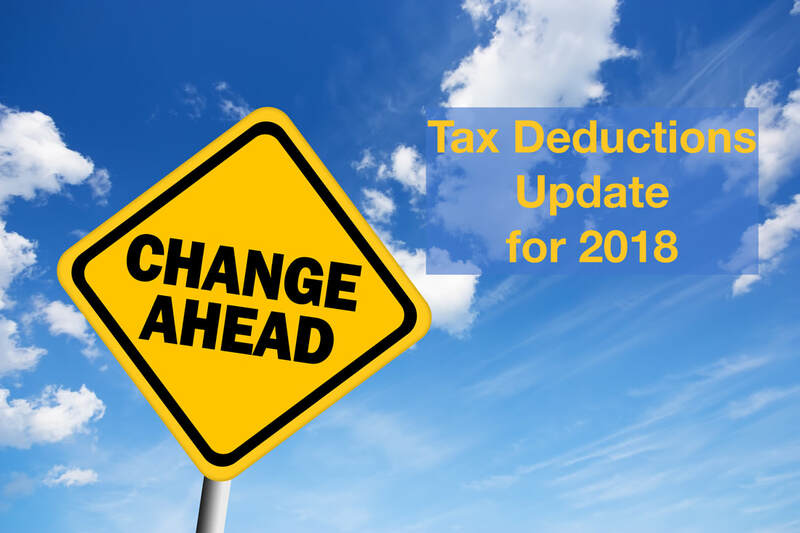 Due to the changes to deductions that came with this tax bill, many fewer taxpayers will benefit from itemizing their deductions on Schedule A in 2018, instead preferring to take the newly-increased standard deduction. What are the itemized and standard deductions? Each year taxpayers receive a certain amount of income that is not taxed. It is not taxed because it is deducted from one's gross income to calculate a taxable income amount, on which taxes are then assessed. The amount that gets deducted can be figured in one of two ways. Standard deduction: Deduct a specific amount based on your filing status - singles (and married filing separately) deduct $12,000, heads of household (single w/dependent children) deduct $18,000, married filing jointly deduct $24,000. Itemized deductions: Add up the amount of all deductible expenses - most commonly these include: state income (or sales) tax, property taxes, mortgage interest, and charitable giving. As of 2018, only $10,000 of state taxes and property taxes may be deducted! What happened to personal exemptions? They're gone. This was a big change for 2018. In 2017 a single taxpayer got a standard deduction of only $6350 but had their taxable income additionally reduced by a personal exemption of $4050 for a total taxable income reduction of $10,400. This was replaced in the TCJA by a larger standard deduction. The personal exemptions one used to claim for dependent children was replaced with an increase to the child tax credit. Student loan interest and traditional IRA contributions reduce your taxable income but are not itemized deductions. If otherwise eligible, you will benefit from these adjustments even if you take the standard deduction. So how do I know if I want to take the standard deduction or itemize deductions? Liam is single. He pays $5000 of state income tax, $4000 of property taxes, and $8000 of mortgage interest. His SALT of $9000 is fully deductible, and after adding in his mortgage interest, his total itemized deductions are $17,000. Compare to a standard deduction of $12,000 - Liam should itemize his deductions! Marissa and Dale are married. They pay $6000 and $4000 of state income tax respectively. They also pay $5000 of property tax and $12,000 of mortgage interest. Despite paying $15,000 of SALT, only $10,000 is deductible. With mortgage interest, their total itemized deductions are $22,000. Compare to a standard deduction of $24,000 - Marissa and Dale should take the standard deduction! If it were still 2017, Marissa and Dale would have had $27,000 of itemized deductions and a standard deduction of $12,700 making itemizing clearly advantageous. In 2018 many taxpayer who have been itemizing for years will find themselves taking the standard deduction. Check out the calculator below to see how your deductions stack up in 2018! You may have noticed that by having a higher threshold to benefit from itemizing, one may not realize the same tax benefit for charitable giving as in prior years. If you do a lot of charitable giving, it may be more effective to “bunch” this giving. I’ll talk more about that in my next blog post. Stay tuned! This calculator compares your itemized deduction to your standard deduction, accounting for the most common itemized deductions. I am a big fan of Roth IRAs, and I think just about everybody should have one. The best part? As long as you have earned income, you can! I tackled the topic of contributing to a backdoor Roth IRA if you are over the income limit for regular contributions in my last post. But I had one caveat — backdoor Roth IRA conversions should be done when the only traditional IRA money you have is that after-tax (nondeductible) contribution you made with the intention of doing a Roth conversion and you have no other pre-tax money in any traditional IRAs. If it happens to be the case that you do, there are ways to fix that. Why do I have money in a pre-tax traditional IRA? Since you’re looking to do a backdoor Roth, and the income limits for Roth contributions are higher than the income limits for pre-tax traditional IRA contributions, you probably haven’t recently been contributing to a traditional IRA. But maybe a few years ago, you were earning less and you did make contributions. Or maybe you did because you didn’t have a 401(k), so you used a traditional IRA. Another common source of pre-tax IRAs are 401(k) rollovers. When you leave a company, you’re allowed to move your 401k to either another 401(k), or roll it over to an IRA. In the past, this was usually the best choice — an IRA has the advantage that you pick the brokerage, so you can go somewhere with the best (i.e. lowest cost) fund choices. But these days, employees are demanding better 401ks and many companies are delivering. That fact combined with the desire to do a backdoor Roth leads to me frequently recommending clients avoid rolling over their 401(k)s to IRAs. What’s the problem with having a pre-tax traditional IRA? It all comes down to taxes. Money that goes into a Roth IRA, via direct contribution or conversion, must have already been subjected to income taxes. If you are converting a pre-tax traditional IRA with $5k in it to a Roth IRA, you will add that $5k to your taxable income for the year. However, if you put $5k in an after-tax IRA, you have already paid taxes on that money and so no further taxes are incurred when you convert to a Roth IRA. But what if you have post pre-tax and after-tax dollars in traditional IRAs? Even if they’re held in separate accounts, you can’t cherry-pick the after-tax dollars for conversion. You have to convert a prorated amount of pre-tax and after-tax dollars based on the ratio you hold, and then have to pay taxes on any pre-tax dollars converted. So, if you contribute $5500 to an after-tax IRA but already have $55k sitting in a rollover IRA, then over 90% of any amount you convert to Roth will be taxed. That’s not what we want! So am I out of luck, or is there some way I can still do a backdoor Roth IRA? Fear not. We didn’t come this far just to be disappointed. The prorata rule only applies to money in your IRAs, so the solution lies in getting your pre-tax funds out of your IRA. The best option for clearing out your pre-tax traditional IRA is if you employer will allow you to roll-in your IRA to your 401(k). This is pretty common. And when doing a roll-in, you do not do it on a prorated basis. In fact, only pre-tax money may be rolled into a 401(k). If you don’t have a 401(k), or yours doesn’t allow roll-ins, another option is to open a solo 401(k) with a brokerage that does. In order to open a solo 401(k), you’re going to need to have some self-employment income. So, now’s the time to break out that entrepreneurial streak and find someone to pay you to do something, anything. You’ll report it as taxable income, use that income to open a solo 401(k), and the roll-in your pre-tax traditional IRA to clear the way to allow backdoor Roth contributions for years to come. When do I need to clear out my pre-tax IRA by? Most things with the IRS are evaluated on an annual basis, and this is no exception. All that matters for getting your backdoor Roth conversion done with no additional taxes is that your pre-tax IRA be rolled into a qualifying account before December 31st. This seems like a lot of work just to be able to do a backdoor Roth IRA. If you can roll your your pre-tax IRA into your employer’s 401(k), you are looking at about 30 minutes of work. I’ll refer you back to my initial post on backdoor Roths — 30 years of backdoor contributions will likely yield a tax-free gain of $219k (in 2017 dollars) on your $165k investment. Double that as a married couple and then scale all those numbers up for inflation, and you’re looking at a huge present for which your 70-year-old self will thank you. Whenever I talk to a high-earner who wants to know what their financial priorities should be my response is always the same — max out your 401(k) to the full IRS limit ($18k in 2017) and max your Roth IRA. Lest you fear the term “backdoor” imply something nefarious, I assure you it doesn’t. Those congress-critters that voted on this change had plenty of self-interest motivating them. In fact, most of them take advantage of this provision, and so should you! While rumors pop up now and then that this provision may be altered in the future, such changes would not be retroactive, and should not be a deterrent to maximizing your tax-advantaged holdings today. To illustrate the value of Roth contributions, here’s an example, with all numbers in 2017 dollars using a real rate of return of 5% — if you put the IRS max of $5,500/year into a Roth IRA for 30 years you would end up with $384k from your $165k of contributions, a gain of $219k from which you can withdraw completely tax-free in retirement! (Or you can allow it to continue to grow - Roth IRAs make a great inheritance vehicle.) And even before age 59 ½, the amount of your principal contributions can be access tax and penalty-free at any time, so you don’t sacrifice liquidity as you start to save. So what is this backdoor Roth thing? As of the law change in 2010, while there is still an income limit on Roth IRA contributions, there is no income limit on conversions from a traditional IRA to a Roth IRA. Furthermore, there is an income limit on taking a tax deduction for contributing to a traditional IRA, there is no limit on making an after-tax (nondeductible) traditional IRA contribution. Are there any “gotchas” I need to look out for? There is one big caveat here. Doing a backdoor Roth IRA works best when you have no existing traditional IRAs. If you do, for example because you rolled an old 401k into an IRA, there are options that we’ll discuss in my next post on the Avoiding the Prorata Tax on Roth Conversions. 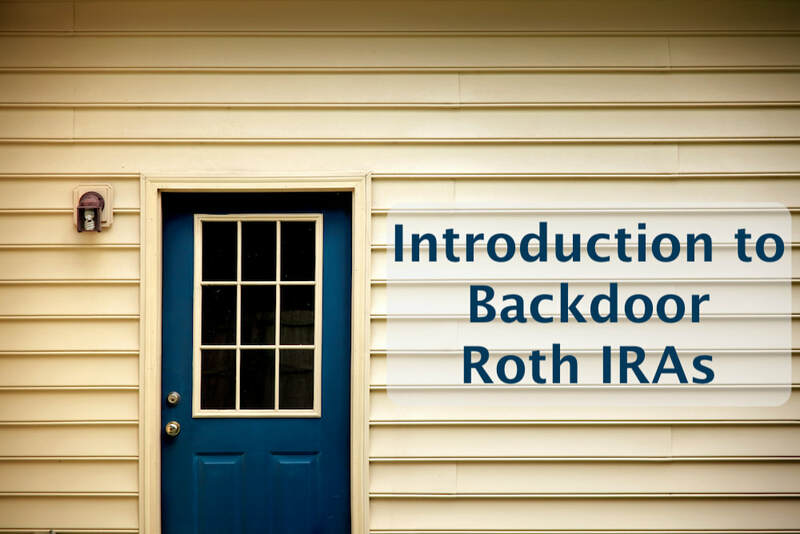 How exactly do I make a backdoor Roth IRA contribution? Open a traditional IRA and contribute up to $5500 ($6500 if you’re over 50). Transfer the funds from the traditional IRA into your Roth IRA. When you file your taxes, report that you made an after-tax (nondeductible) contribution to a traditional IRA on Part I of Form 8606. Report that you made a conversion from a traditional IRA to a Roth IRA. The Finance Buff has a fantastic walkthrough of how to report all of this in online tax software. How long should I wait between making the contribution and doing the conversion? Back when the backdoor Roth was new, there were concerns that not waiting long enough between the contribution and conversion steps might be objectionable to the IRS. While it is always possible they could decide this at some point in the future, over seven years and millions of Roth conversions they have not disallowed any for this reason. Go ahead and do your Roth conversion whenever is convenient after the traditional IRA deposit has cleared. Is there a five-year rule on withdrawing principal from a backdoor Roth IRA since it’s a conversion? No! If you plumb the depths of IRS Form 5329 you’ll discover that the rules restricting withdrawals of Roth IRA conversions only apply to amounts which were subject to taxes in the conversion process, which is not the case for converting a nondeductible traditional IRA. I thought I was only supposed to contribute to a Roth IRA if I expect to be in a higher tax bracket in retirement. 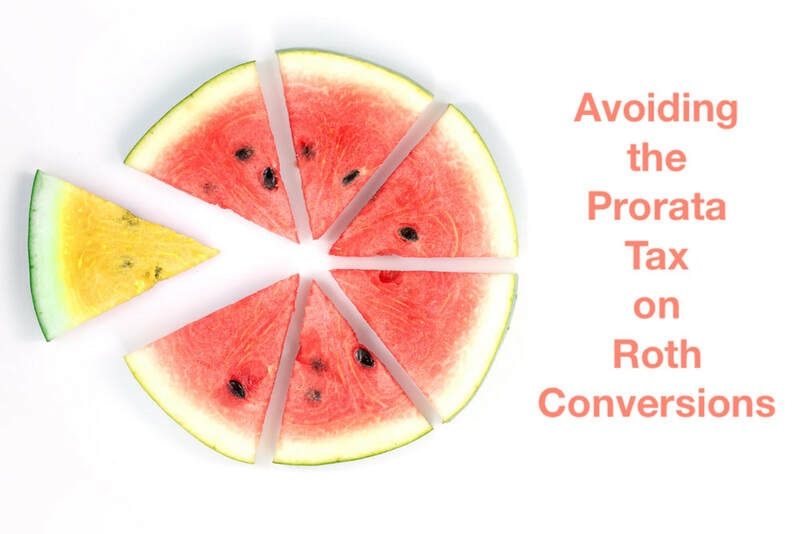 When you hear that you should “contribute to a Roth if you expect to be in a higher tax bracket in retirement,” that is referencing the choice of making Roth contribution versus contributing to a traditional tax-deferred account. If you’re worried about a backdoor Roth IRA, I’m willing to bet you have an employer-sponsored retirement account and are over the income limit to deduct traditional IRA contributions. If you are at the point where all your other tax-advantaged account are full, the calculus changes. Now your options are investing in a Roth account where you’ll never pay taxes on this money on its growth again, or investing it in a taxable account where every dividend or sale is going to siphon off bits of your money to taxes, eroding your return. This sounds great! Is there any reason I shouldn’t do this? With the dual benefits of tax-free growth and the flexibility of withdrawals offered by Roth IRAs, this is a no-brainer for most people. If you have high-interest debt, that should always be your first financial priority. But if you’ve for your bases covered and are looking at how to make the most of your savings for the future, get yourself a Roth IRA. Maybe you’re leaving your first job and have a few thousand dollars in a 401(k) and have just received a letter asking what you want to do with it. Or maybe you weren’t even given a choice — it is common for small 401(k) balances to be automatically cashed out after you leave a company. It may be tempting to stick that money in your checking account, but you will end up paying a 10% penalty on top income taxes at the end of the year if you do that. When the 401(k) account is disbursed, some money may be withheld for taxes. If you don’t redeposit the full pre-withholding amount of the disbursement, any missing amount will be subject to taxes and penalties at tax time. Many brokerages have a $1000 minimum for opening an IRA. To deal with Pitfall #1, if you had $1500 in your 401(k) and are issued a check for $1100, you can make up the $400 out of your own bank account when making the IRA deposit. The extra $400 will be refunded to you when you file your tax return. 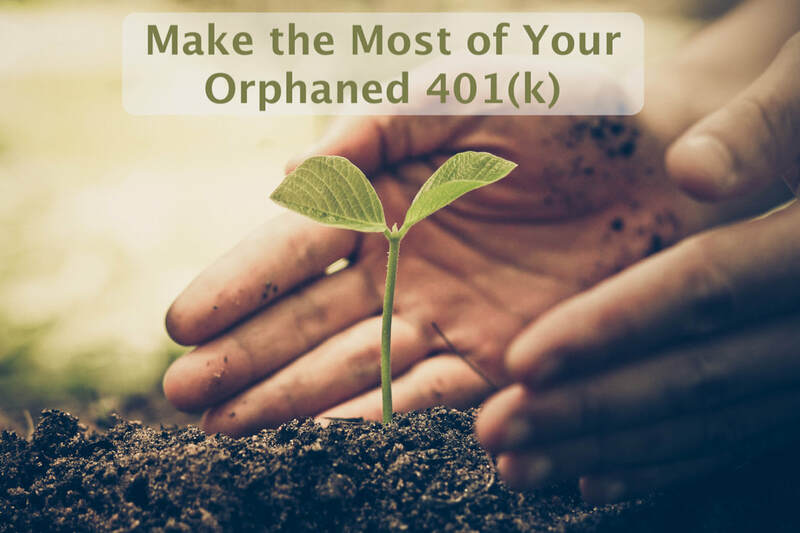 Or, if your 401(k) balance is not sufficient to open an IRA in the first place, you can take this as an opportunity to set aside a bit more money for retirement and top up the rollover to the amount necessary to open a new account. Assuming you are rolling over from a traditional 401(k), you will initially be putting this money into a traditional IRA. However, if you are a young person in a low tax bracket, or even a student working only part of the year, this can also be a good opportunity to convert that IRA to a Roth IRA. This will cause whatever amount you convert to be added to your taxable income for the year. But if you only made $5k, you will still be below the threshold where you incur any taxes. Even if you are in the 10% or 15% tax bracket, this can still be a great chance to jumpstart your tax diversification for your retirement savings. Remember, you don’t have to do this alone. Working with a fee-only financial planner can be the perfect way to educate yourself about your options, roll over accounts correctly to avoid penalties, and more. Feel free to contact me today, and we can discuss your unique situation. Investment advisory services are offered through Eos Financial Planning LLC, an investment advisor registered with the Commonwealth of Massachusetts. © Eos Financial Planning LLC 2017-2018. All Rights Reserved.